A policeman has shod down a bear with the service weapon at Vanino port (Khabarovsk Territory), says press center of Transport Department at Russian Interior Ministry’s Far East Branch. A message received by telephone at Vanino police station’s call center said that a bear had come from the woods to the territory of Vanino seaport. Two police teams of Vanino Department were sent to the site. While driving around the territory and using the loudspeaker systems, the policemen and the port’s security personnel were warning the port personnel and the ships crews about the danger of staying in the open space. “The wild animal, who came to the port, was rushing about the storage area and auxiliary facilities looking for a way out. It was infuriated with hitting different obstacles, its behavior was unpredictable,” the statement says. With a horn sound the policemen tried to force the bear out to a desolate place, outside the port towards the woods. “Yet, the bear ran towards the engineering workshops not far from a heavy truck parking where port employees were staying. Having hit the fencing, the infuriated animal rushed towards one of the policemen who had to use his service weapon having no opportunity to escape. The bear was deactivated”, the statement says. A check was initiated to justify the use of weapon. 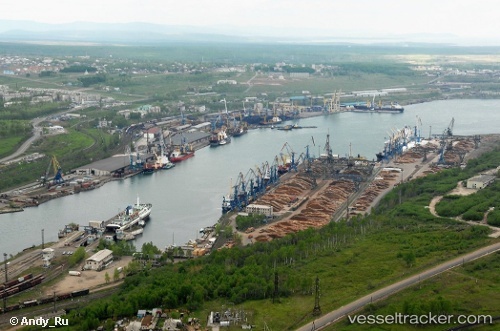 On December 6, within the framework of the Transport Week – 2013, FSUE Rosmorport and Far East Vanino Port LLC signed an agreement on construction of a specialized terminal for transshipment of coal at port Vanino (Khabarovsk Territory), IAA PortNews journalist reports. The document was signed by Rosmorport Director General Andrey Tarasenko and Far East Vanino Port Director General Victor Sokhranov. This project implies the construction of a coal terminal with annual capacity of 15 mln t. Coal cargo is to be delivered to the terminal from Elegest coal field (central part of Tyva Republic), which is a part of Ulug-Khem coal basin. To transship the expected volumes there should be built two berths at double-sided pier. The terminal is supposed to handle vessels with deadweight of up to 120,000 t.
JSC Sakhalin Shipping Company (SASCO) has suspended ferry traffic between Sakhalin and the mainland due to the storm in the Tatar Strait, caused by Typhoon Bolaven, a spokesperson for SASCO told RIA Novosti. "Currently, all the ferries are on the side Vanino (Khabarovsk Territory). The decision to resume traffic on the line Vanino-Kholmsk will be taken depending on the weather conditions," said the source. Storm warnings have been declared in northern Sakhalin because of the approaching typhoon.